There are more angel-backed companies in the US than ever trying to capitalize on a favorable economic market for startups. In 2012, more than 1,500 startups received a round of angel funding. As these companies mature and look for the next stage of financing, venture capital investors are adapting to the new Series A landscape. And something else is happening. We’ve noticed a significant new trend in our ongoing effort to analyze the fast growth in early-stage funding over recent years. Angel-backed companies are taking extra long to close Series A rounds, according to our latest funding data from CrunchBase. Venture is more available than ever for angel companies, as we covered recently. It’s been angel investors who have reduced the number of deals and amount of money they’re putting in versus 2012. Meanwhile, many companies can choose to wait longer. They are raising larger angel rounds early on, as we’ve also covered, allowing them to last longer without going to VCs. They can also secretly raise additional angel money via convertible notes, too. And many companies have more ways than ever to monetize what they’re creating on web and mobile — they can bootstrap and push for the terms they want, or even self-finance their growth. 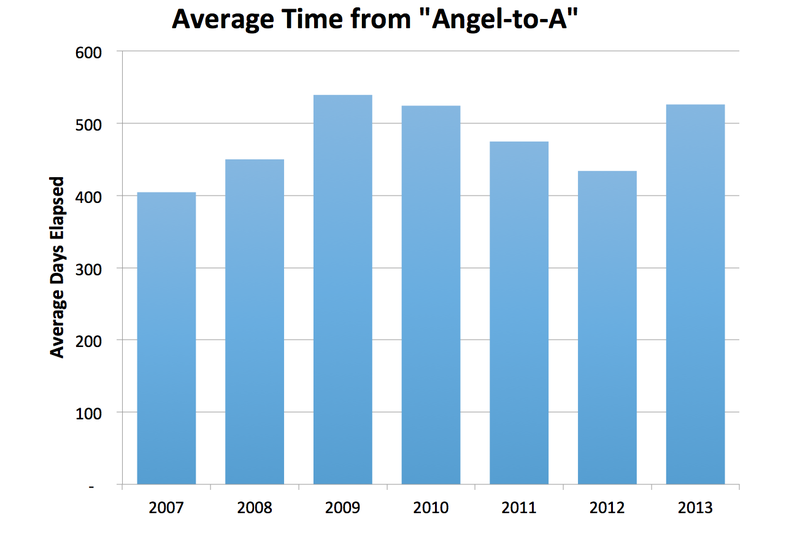 Angel-to-A deals that closed in 2012 took an average of 434 days between securing an initial angel investment and closing the first venture round. So far this year, Angel-to-A companies that closed a Series A round in 2013 had taken 526 days on average between the two funding rounds, an increase of over 21%. The funding gap is the largest since 2009, in the midst of the economic downturn. However, not all investors are concerned with this apparent Angel-to-A lag. Looking at the largest angel firms both in deal number and size, we found that many top firms have quickly and consistently followed up their portfolio angel investments with venture rounds. 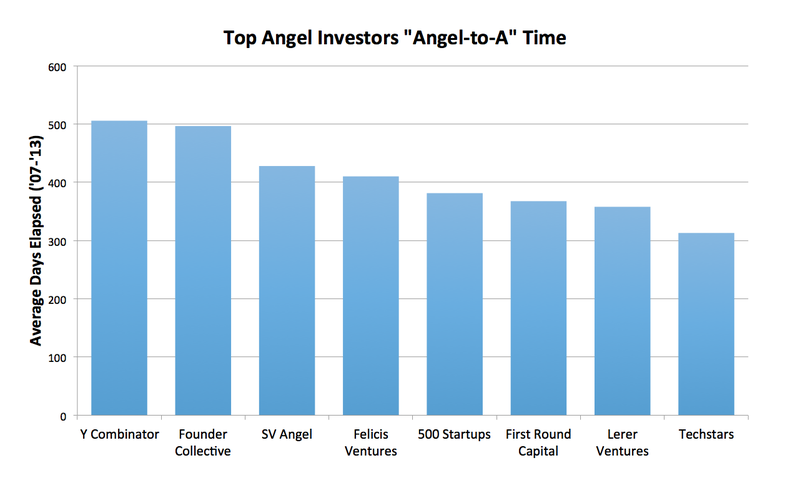 If you broadly define angel groups to include both accelerators and non-accelerator angels, Techstars and Lerer Ventures‘ companies managed to find venture investors within a year on average. Y Combinator had a much slower pace at 506 average days, but their relatively small angel rounds have produced Series A rounds of over $21M on average. That Angel-to-A size increase of about 45x is nearly double that of any other major angel investor. 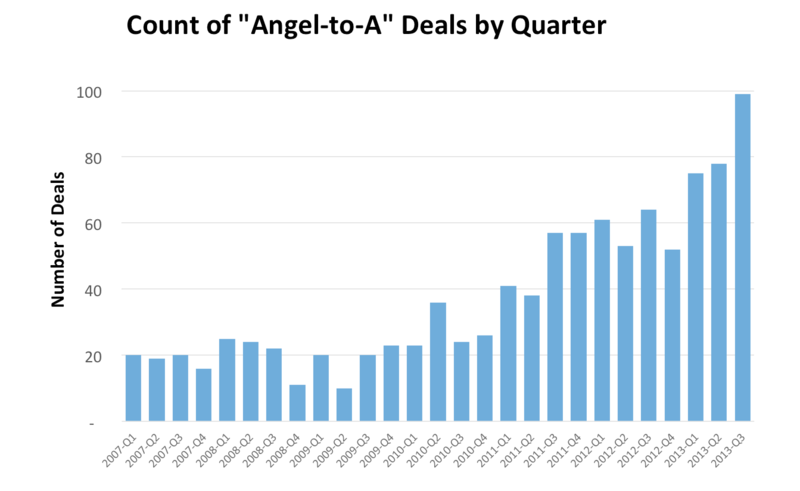 Despite the longer wait for Series A money, in the first three quarters of 2013 the number of angel-to-venture deals has actually risen considerably, suggesting venture firms are still eager to fund angel startups. The difference may be that Series A deals are being made at later stages and looking more like traditional Series B rounds as we pointed out earlier. As always, download the CrunchBase September 2013 Data Export and let us know what you find.